Today (12th February) St Francis of Assisi Catholic School was officially opened by Fr John Adams who was standing in for our Bishop, Bishop Barry Jones, who is very unwell at present. It was an exciting day for us. We had a wonderful opening ceremony. 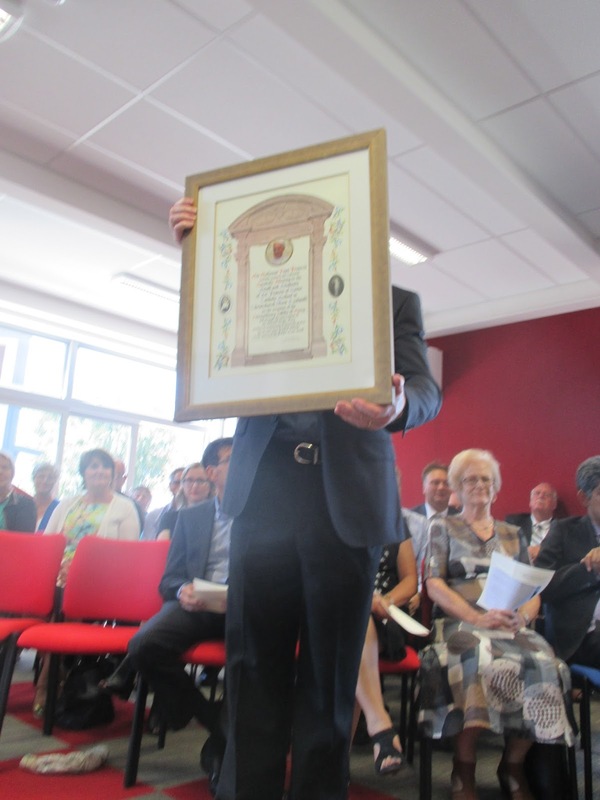 One of the highlights was the sharing of the Papal Blessing that we received (held here by Father Simon). 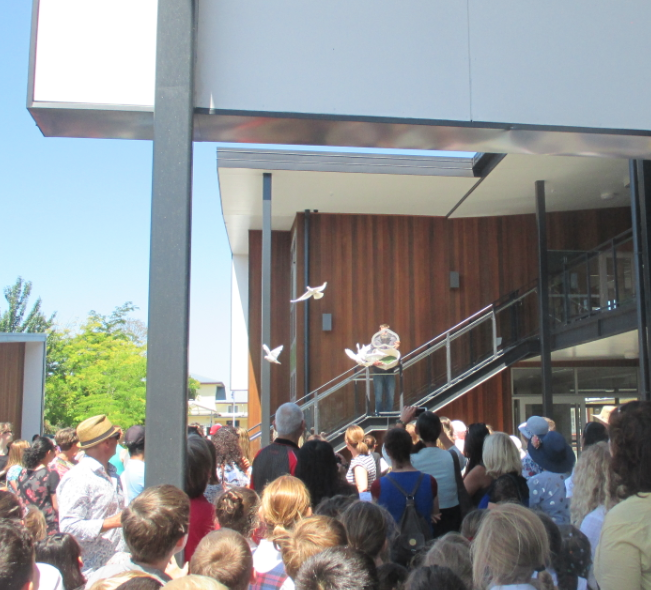 Another highlight was the release of the doves to signify St Francis' love of animals. Greeting by Deputy Principals: Maire Bowler and Sarah Burrowes. All invited to move outside. Official Ribbon Cutting: Fr. John Adams. Here is the text of my speech - shared here for those who were unable to make it. I also, extend a very warm welcome to everyone here. Thank you for taking the time to share in this special occasion with us. I consider it a privilege to have been welcomed into this parish community as principal designate last year. We are privileged within this Parish to have such a wonderful learning environment that enables us to be a progressive learning community. While we all know that it is not just about the buildings, we are very grateful to have these flexible learning spaces. I want to thank the huge team involved in creating this learning environment - from the planning stage right through to ensuring we were ready to open on February the 4th. This has been a huge project and it has been carried out by a variety of organisations and executed with passion and skill, I know how mammoth this job was, and we at St. Francis of Assisi appreciate your work. I am really excited about the way forward for this school. We have been particular about staffing the school with enthusiastic, skilled, passionate and hardworking educators and I am really proud of the team that we have created, and the work that they have already undertaken to ensure St Francis of Assisi Catholic school was ready to open. If we are doing our job of being a truly Catholic school, then the philosophy behind the school, the ethos we should have, the way we do things - should be distinctly Catholic. We aim to be a progressive Catholic School and to be the school of choice for Catholics in the St Francis of Assisi Parish area. I want to thank Mike Nolan, Cushla O’Connor, Father Simon and Father Matthew for their support in helping us do our job of being a truly Catholic School. I have been very fortunate to have worked with a supportive establishment board who have always had the best interests of the St. Francis of Assisi community at heart. They too have worked hard behind the scenes to establish St Francis of Assisi School. Thanks to Alison Wilkie and her team Matt Tippen, Tom Music, Liz Gardiner and Bill Morgan and thanks to Terri Johnstone for her support and wisdom along the way. There have been many people who have contributed to the successful establishment of our school including from the Ministry of Education, Jill Forgie, Murray Aiken and Coralanne Child, I appreciate your availability for all of my endless questions! I would especially like to acknowledge Peter Callanan, Chris Callaghan and Tom Scollard for their support of me as I transitioned to my new role. I have appreciated the valuable advice I have received. 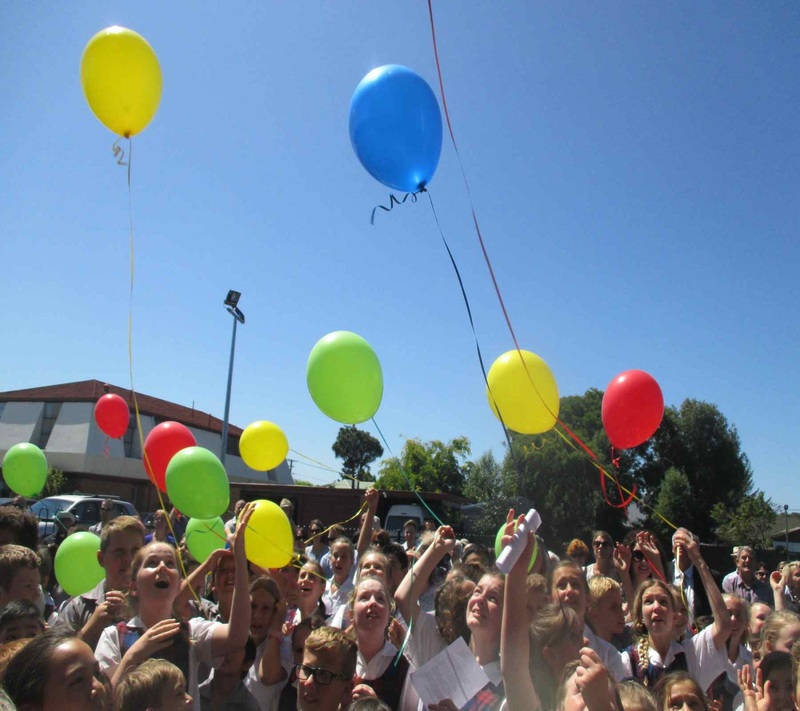 And now - the children - Ko te tamaiti te pūtake o te kaupapa - the children - the heart of the matter. We are determined to take this opportunity to build a Catholic school that educates the whole person God created: academic, physical, spiritual, emotional, moral and creative. We will find ways to develop leadership, confidence, and community spirit. We will do this through our work in the classroom, the relationships students develop with their teachers, the relationships we build with our parent community and parish – and also through sport, cultural activities, Christian action, leadership, camps, prayer, and liturgy. We are all in good heart and excited about the future, We are all here today for the children. Thank you everyone involved, for making our children your priority. Wishing you a fabulous start in your stunning new environment. Congratulations!